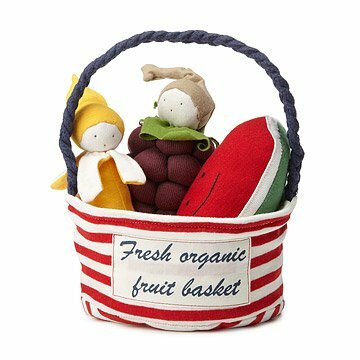 Give little ones their first harvest with this charming basket of stuffed toy fruits, great for tiny teethers. We think these toys are really grape! Made and stuffed with 100% organic Egyptian cotton, these adorable toys are ideal for all ages and will encourage your child to develop a positive attitude towards fruit. Super-soft, easy to grip and washable, babies can chew on the fruits while teething, while older children can use them for imaginative play. The striped fruit basket has a braided handle and the embroidered message, "Fresh organic fruit basket." Includes banana, grape and watermelon. Sold as a set. Made in Egypt. Click here to read about creator Janice Masoud and the Sekem organic cotton farm and see the matching veggie crate. Teethers: Machine wash in cold water and machine dry. Tote: spot clean. Teethers for all ages; basket is not a toy, not for children under 3, and is intended for storage purposes only. The organic fruit basket went over well with the two-year old recipient. It is frequently played with and routinely among the toys brought along on play dates. My 4 month old loves these soft teethers. They are easy to grasp and have a good mouth feel. She also loves the braided handle on the basket. They are easy to clean and very cute, I always have this "organic fruit basket" on display when guests arrive. My baby will be starting solids soon and these will help her to learn about foods. This was a great hit. 3 year old niece loves to take all the fruit out and then put them back in basket. I bought this gift for my niece who is expecting her first baby! She's going to LOVE the fruit basket. The basket is made of Great Quality material, it'll last a long time. I was amazed at how cute this item is. My Great Grandchild will truly love it, if I can bring myself to let go of it first. I wish they had things like this when I was a young parent. I know when I give it to my Grandson to give to his son he will be delighted! I bought these for a first-time parent (along with the oxford socks). I love these little fruits! They seem durable and are soft yet sturdy. Important selling features for me was that they are safe for teething babies and they can be washed! These teethers are all so cute. They're very durable and my 4 month old loves them. She chews on them every day. We gave them all names too :). They would be a great gift. I gave this as a gift to my 18mo. old goddaughter and she just loved it! She particularly liked the banana toy. Her parents liked that it was a "quiet" toy she could bring with her to church. Great quality!